birds who are the secrets of living"
Many of my feathered friends have been on a feeding frenzy. cardinals and even a few bluejays. and rooms are ready for their guests. for the family that will soon gather. Hope your Thanksgiving is filled with love and joy, my friends! And of course, a few spats. It wouldn't be Thanksgiving if there weren't some disagreements! Go check out some awesome birds! I always love your bird photos! I do hope you and your family have a wonderful Thanksgiving with all the blessings of the season! i am thankful for your friendship and beautiful bird photo's!! You're right. It wouldn't. I seem to remember last year a blogger saying it wouldn't be Thanksgiving until someone cried. Have a lovely Thanksgiving, Reena. Impressive photos! Happy Thanksgiving to you! Beautiful shots, Reena! Excellent! Enjoy your Thanksgiving! Great photos of the birds - nice thoughts about Thanksgiving - and the comment about the "spats" made me laugh! Love the quote and photo. Wishing you a wonderful Thanksgiving! Wow, I really love that poems! Your photos are very captivating! I don't foresee any spats or tears...uh wait, the grandkids will be there. There could be a possibility. Have a nice Thanksgiving. We will. Have a spat-free and happy Thanksgiving! Love that last shot. Great capture of a disagreement. Great captures hope you have a Happy Thanksgiving. Beautiful and funny at the same time. Last shot is awesome! 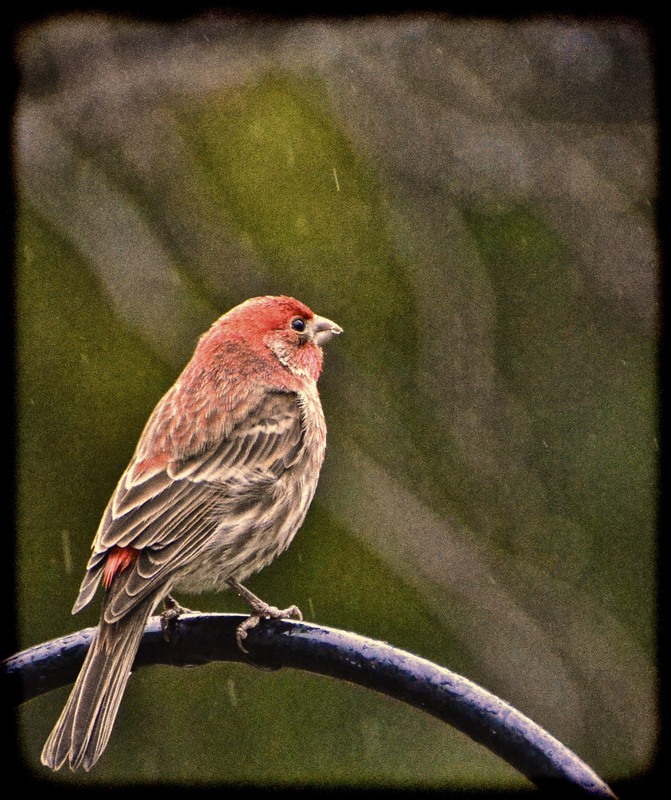 Great post and lovely bird photos, Reena! I wish you and your family a vey Happy Thanksgiving. Love that last shot, birds and squirrels have been on a feeding frenzy here too. Happy, Blessed Thanksgiving to you, Reena. Enjoy your time with the family. Have a wonderful Thanksgiving! For me, I am thankful that we will be winging for home that day. Chuckling at that last photo! Thanksgiving blessings to you. The robin photo is priceless! Amazed you still have them around (or was this taken earlier?) No matter -- it's awesome! Have a great Thanksgiving, this is a nice tribute. I'm very concerned because my bird feeders are vacant. I cleaned them and filled them with fresh food, I even replaced a couple of the feeders - nothing, not even the squirrels. Beautiful images!! What cute little birds. Happy Thanksgiving all the way from Australia!! little lovelies! enjoy your family feast, dearheart! What a lovely post. Happy Thanksgiving to you and your family, too. Have a wonderful Thanksgiving with your loved ones as well. Two lovely images, Reena. Happy Thanksgiving to you and your family! Ha! Love that robin shot, wow! Wishing you and your loved ones a wonderful Thanksgiving! Sounds like you are going to have a wonderful Thanksgiving. I love your birds today - especially the robins - how true!! Haha, that last photo...how apropos for your spat comment. :) Hope you have a wonderful Thanksgiving as well! Great shot! This shot has expressions embedded! Happy Thanksgiving my dear, you are so right, no family gathering is complete without a few old sores cropping up. Glad to see the humans having a feeding frenzy one in a while, not just the birds. Awwwww....look at that pretty lil' guy! Great post!! Have a good Thanksgiving. Boom & Gary of the Vermilon River, Canada. Birds know how to be thankful for the littlest of things. Have a perfect Thanksgiving, Reena! Wishing you and your family a beautiful Thanksgiving Reena. A couple of lovely bird shots! Happy Thanksgiving! Beautiful Reena. Have a wonderful Thanksgiving and may the spats be few and friendly. Sounds like you are all ready for your holiday Thanksgiving. Hope you have a good one! Love the spats photo. I had not heard that E.E. Cummings quote...Amen to that. Finch picture is awesome too. Time to cut a pie! I've seen you comment on a lot my bloggy friends posts...decided to stop in an visit...so glad I did..
well said and beautiful photographs. The first is almost built like a sparrow/canary, so similar really aren't they excepting of course for plumage colours. Happy Thanksgiving. A beautiful bird and some very beautiful pictures. Bravo! Happy Thanksgiving.. I do hope it's a great one! Your photos are awesome! wishing you a great time and a happy thanksgiving with your precious family! Happy Thanksgiving! Mine already is after seeing your photos!! Blessings to you, my friend. Happy Thanksgiving! Gorgeous post and words! Happy Thanksgiving, Reena. As always I love your birds. 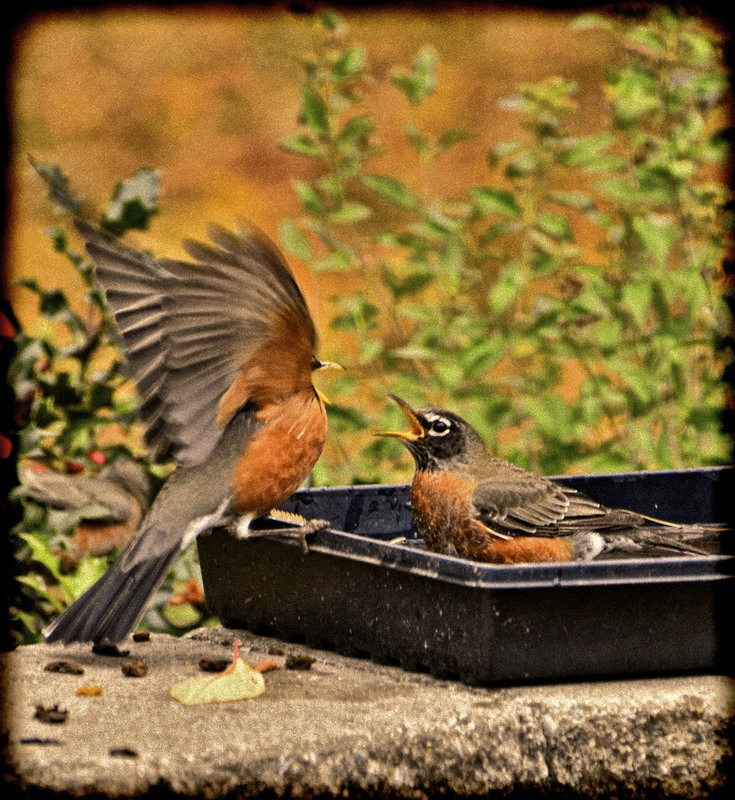 Your robin picture is amazing!! A once in a lifetime shot. Happy Thanksgiving, Reena- Hope you had a great one! Your bird photo's are just breathtaking! Happy Thanksgiving to you, hope you had a good one. You know it. What would any holiday be, when families gather, without having a few rows. My first cousin, who kinda was a third mom to me, passed away this past Tuesday. What a damper on the holidays, of course. Cheers! !